Although it is convenient, fast and tasty, the many disadvantages of fast food should discourage people from indulging in eating this type of fare on a regular basis. Unfortunately, marketers target the youngest of the population, enticing our next generation to eat unhealthy with dire consequences ahead of them. Fast food is a relatively new interference in our dietary habits, having only been popular for about the past 60 years. Coinciding with the rising popularity of the automobile, fast food restaurants are believed to have originated in California to take advantage of a growing population of mobile individuals. The preface of the industry was a sound one, and a plethora of businesses offering a diverse assortment of foods served quickly and with few frills soon emerged across the United States. The main principle behind fast food is that the food is served fast, hence the name. Eating on the run has become a familiar and all too convenient course in the busy lives of people in the United States. Whether the food is hamburgers, chicken, pizza, Mexican fare, fish or salads, there is generally something on the menu for each member of the family for a fraction of the cost of preparing it homemade. Added to these attributes is the fact that this food does indeed taste delicious. 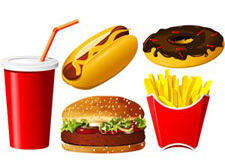 The disadvantages of fast food, however, greatly outnumber the convenience, availability and speed of the fare; especially when the indulgence for the food occurs on a regular basis. Fat is probably the number one issue with fast food products. Considering the fact that the average human should have no more than 65 grams of fat each day, choosing a value meal at a fast food restaurant that includes a large hamburger, a large order of French fries and a beverage which combined contains at least 63 grams of fat is an obviously unhealthy choice for a meal. Unless each of the remaining two meals consumed that day were totally lacking in fat, these numbers would soon add up to extra unwanted pounds. Don’t be fooled into thinking that a fish or chicken sandwich would be a better choice, even though these foods are touted as being healthy. Many of the fish and chicken offerings at a fast food restaurant have a higher fat content than is found in a hamburger purchased at the same joint when breaded and fried. The calories consumed in a fast food meal are equally as damaging to our health. Unless our energy output is greater than the calories we take in, our weight begins to edge up the scale. As excess fat accumulates on our frames, it begins to take a toll on our heart, blood pressure and blood sugar. Most kids need only 2,000 calories per day, while adults require even less. Yet just one fast food hamburger can carry up to 750 calories, not to mention the French fries which carry at least another 350 calories. More and more children are beginning their lives obese because of poor food choices and lack of exercise. Another disadvantage of fast food is the breakdown of family life. A family together in the kitchen, preparing dinner, is an opportunity to bond and communicate. Eating on the run means less time spent around the dinner table, where the day’s experiences are shared with other members of the family. Fast food is certainly an occasional fun treat, and there are healthy menu choices. Sadly, too many people visit too often, with unwholesome results and bad habits setting the stage for health disasters for our young people.